In adopting a vegetarian diet, the general exclusion is flesh foods – fish, fowl, or other parts of animals. Ovo-lacto vegetarians may include dairy products in their diet such as milk, cheese and yogurt and eggs. Strictly speaking however, eggs are flesh food and therefore there are those vegetarians who will exclude eggs from their diet. After understanding the reasons as set out in this article, you may decide also to exclude eggs and find that you don’t miss them at all! Eggs are high in cholesterol: A single egg contains 252 to 275 milligrams of cholesterol which is enough to exhaust the day’s cholesterol allocation as set out by health organisations. Dietary cholesterol raises blood cholesterol levels leading to atherosclerosis and heart attack. Another good reason to eliminate eggs from the health angle, is that eggs contain salmonella bacteria – which makes the idea of eating raw eggs (as some people do as a “health” kick) a bad one. In addition, eggs contain no fibre (which is essential for regular bowel movement). A flesh food: If you consider what you are eating when you eat eggs, it is not an appetising food. In reality, a fertilised egg is an embryo – a baby bird – an unfertilised egg is the ovum or by-product of the menstrual cycle of a chicken. Although usually eaten unfertilised (before a living entity takes residence), an egg is still considered a flesh food and as such is in the mode of ignorance (tamas guna). Foods in the mode of ignorance should be avoided because they cover our consciousness, and are therefore not a wholesome or healthful food for a person following a yoga diet. 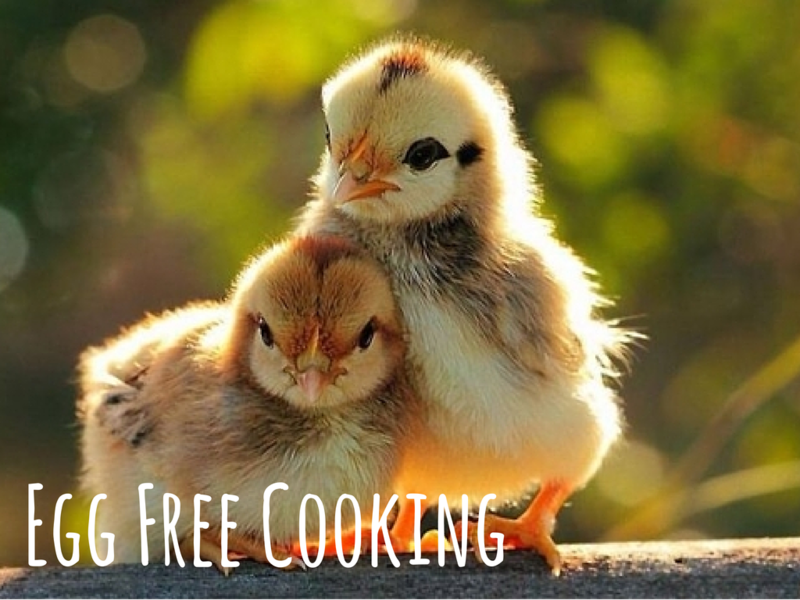 Cooking without eggs: So how to go about all those recipes you have which use eggs? Follow these simple guidelines. Where eggs are used to bind, as in making patties and vegetable loaves, add a little rice flour to the mixture; if it is very dry, add a little additional liquid to help the rice flour bind. Cooked egg dishes can be replaced with tofu. Replace eggs in baking cakes, cookies etc., with 2-3 tablespoons of yogurt per egg. This adds moisture; when the baked cake/cookie begins warming in the oven, the bacteria in the yogurt start to multiply and grow resulting in a light, leavened result. To substitute for egg yolk only, try the following substitute (which tastes the same and has very much the same properties). Take 1 heaped tablespoon of soy flour, mix with 1/2 cup of water, put in a pan and boil until it thickens, stirring constantly so it does not stick. Strain into a mixing bowl and beat in enough soy oil until it becomes thick enough to be cut with a knife. Season with a pinch of salt and use wherever a yolk is desired.